Whether it is regarding a batch of items or a crane, your goods just need to go from A to B. At times, as fast as possible but always at the agreed time. 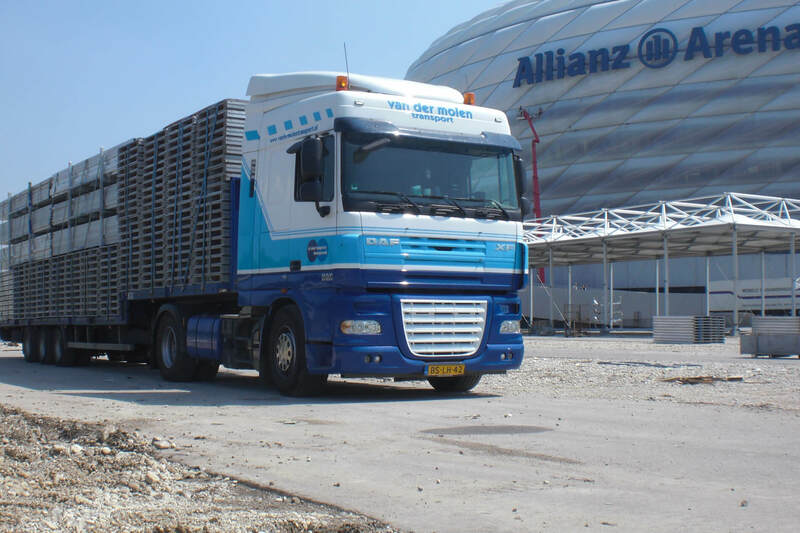 It does not matter how complicated your questions is, Van der Molen Transport will always have an answer. Our 30 trucks feature 40 trailers in various kinds, from flat trailers to low-bed trailers. This gives us so many possibilities that we are able to efficiently respond to any request, even if there is a hurry. With Track and Trace, you can keep track of your goods by means of a live feed. We will consult with you, and then decide the best way to deliver at the location. Six of our trucks have been equipped with truck-mounted forklift and two with a crane. This is perfect for delivering building materials at great heights. Do your goods require several trailers at once? Do you require a multifunctional driver for construction or for a project abroad? At Van der Molen we can discuss all possibilities. Take a look at our Special Projects and Need for Speed. Our 30 drivers are all permanent staff. They all have received the required training, are certified, of Dutch Nationality and they have even been screened (safety requirement for G8 assignments). Every single day, they are ready to deliver any sort of transport and logistics. Call 072-574 42 34 or email us for a quotation.